This past weekend I went to a Shut Up and Write marathon at a cafe in downtown San Francisco. Try as I might to do just that, it was hard to concentrate when history was happening right outside the door. Finally, I packed it in and followed the rainbow clad crowd to the Pride celebration happening down the street. 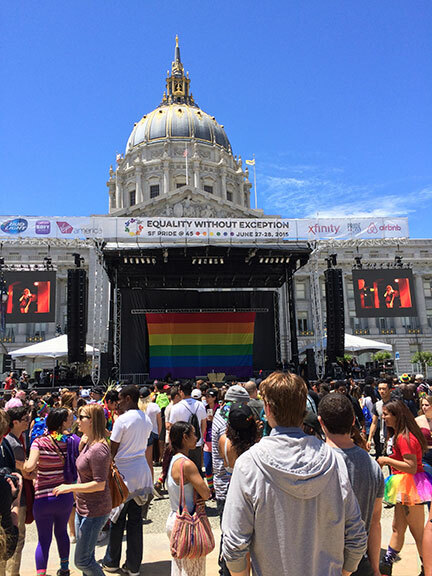 San Francisco City Hall has Pride! It’s always a festive crowd, but this year it was even more so. There was so much happiness in the air over this great victory for human rights. People were literally jumping for joy! 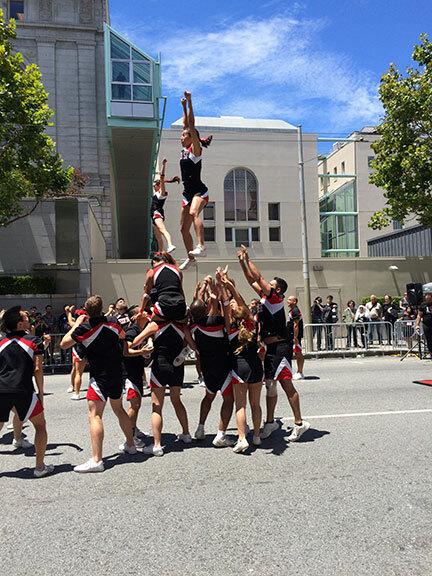 That’s Cheer SF performing at the festival. People were hopping all over the place, having a great time. I did, too, until my computer started feeling heavy on my back and I headed home. Later, when I got online, I noticed some interesting problems mentioned in several writing forums. One person asked, what should writers do if their contemporary WIP concerns a gay couple who can’t get married, since now they can? Another wondered if prejudice against LGBTQ people is an issue any more. Of course, this sparked some interesting debate. For the first topic, it was mostly suggested to set the story a few years ago or deal with what history has handed you. For the second topic, the original poster was reminded that the SCOTUS ruling was 5 to 4 and prejudice sadly remains an issue. When writing contemporary fiction, history can indeed hand you a whopper. Consider this scenario: you spend years working on your saga of espionage along the Korean border. Then, boom! Kim Jong-un is assassinated, and the north and south are reunified. Sound farfetched? So did the fall of the Berlin Wall, but it happened. Authors of Cold War spy fiction probably had to rethink their entire careers. History happens and when it does, don’t panic! Instead, see it as an opportunity to make your story even more relevant. Let’s face it: shutting up and writing is a toughie, especially if it’s the job of your heart, but not your livelihood. Finding time is hard and distractions are plentiful, especially if you’re at home. It’s difficult to concentrate when there are dishes in the sink, clothes in the washer, a hungry pet, a restless child, or a significant other who needs a moment of your time that becomes an hour. Writing in a cafe is one solution, but also has obstacles to creativity, such as grating music, loud conversations, free Internet and answering the call of nature. If you’re lucky enough to trust the people nearby, you should be fine. If not, you either take your laptop into the loo or you head home. Or you can join a Shut Up and Write meetup. Yes, such a thing exists and it is fantastic. I joined the San Francisco Shut Up and Write group, and I have found it to be a very constructive and creative experience. Here’s the description from the SF meetup page. 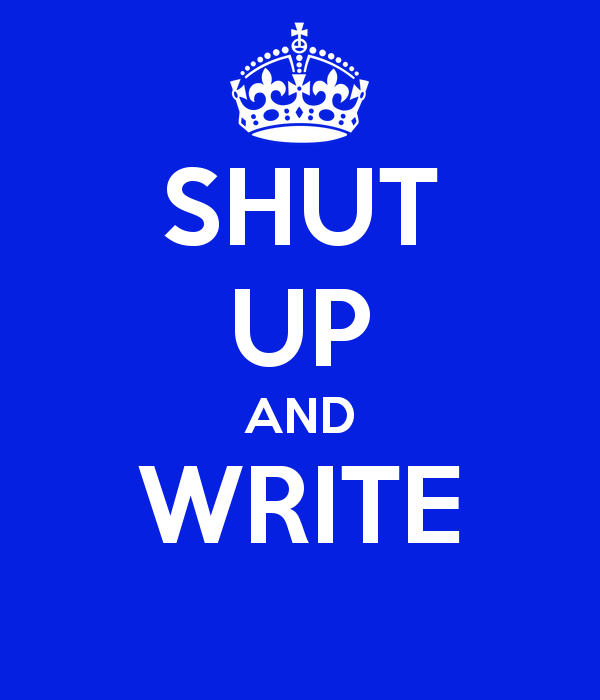 Shut Up & Write! Meetup is a venue for writers to work in the company of other writers on a regular basis. Writing, whether approached as a profession or as an avocation, is an isolating activity. We provide this forum, writing resources and meeting times as a method of developing a community of creative people. We welcome people who are serious about ‘writing down the bones’ and are looking for the companionship of other writers. Making the time to write one hour per week is an empowering and ultimately rewarding experience but it needs to serve as the foundation of your daily discipline. If you RSVP that you are coming, then please arrive 10-15 minutes before the start of the Meetup. The facilitator will lead introductions and then the group will write for an hour. There will then be 15-30 minutes of social time to get to know each other and possibly discuss personal writing successes such as getting published or overcoming writing resistance in some small way. No critiquing, exercises, lectures, ego, competition or feeling guilty. Being part of a group dedicated to getting work done is an empowering experience. Keeping distractions at bay is easier because you’ve set aside this time to write and you’ve physically put yourself someplace where this can happen. 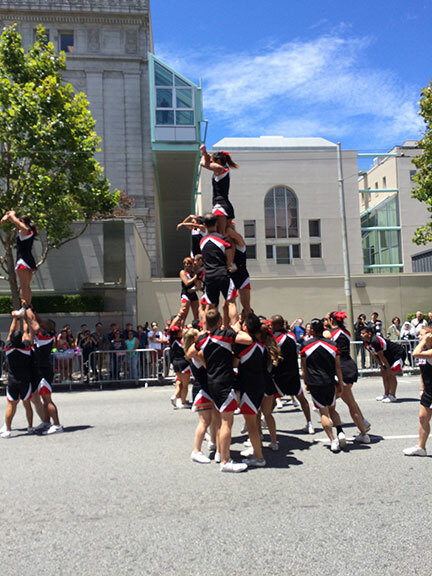 A typical SF group includes writers of fiction, memoir, thesis, reports and presentations. Some groups last only an hour, while many can go three to four hours and even longer, with short breaks. Want to Shut Up and Write? Go to meetup.com and look for a group in your area. You can find SUAW groups all over the United States, Canada and internationally. Similar groups with different names can also be found on meetup. A good place to start is this list of creative writing meetups. Not one in your area? You may want to consider starting a group of your own. Best wishes and keep writing!